Your home’s overhead door consists of many moving parts, all of which play an important part in keeping the system working properly and safely. However, perhaps the most vital components of all are the springs that bear the weight of the door and help it move. It’s important to understand what these components do and how to look after them so you can avoid accidents and unexpected breakdowns. What Type Of Springs Do I Have? 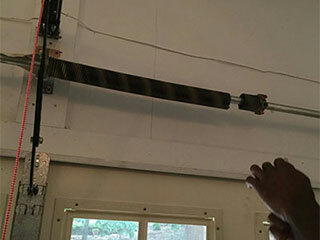 There are two types of springs used in garage doors; torsion and extension. Torsion springs are found running horizontally along the top of your door, and are the most common type; they’re tough and safe, and they provide much smoother movement. Extension springs are usually weaker and less reliable, but they do have one important advantage. They run perpendicular to your door and have a much slimmer profile, which means they can fit in garages with low ceilings, as they require more backroom than headroom. Since they are more likely to break, they are often interlaced with safety cables to keep them in place if that happens. These components are designed to bear the weight of your door each time it’s used. This puts a lot of strain on them, and although they’re built to last they will eventually start to wear out. You can help to extend their service life by applying spring lubricant regularly; this helps to protect against corrosion, and reduces wear and tear. Do not be tempted to adjust or tamper with the springs themselves; they can be extremely dangerous, and should only be handled by trained professionals like our team. As your springs wear out they’ll often give off warning signals. If you find your door struggles to support its weight, if it makes a lot of noise as it moves, or if the door wobbles a lot, your springs might be wearing out. It can be very dangerous to let them weaken any further; if they break, they’ll drop the door on whatever’s underneath it. If you suspect your springs are beginning to wear out, you need to get them replaced as quickly as possible. Even after the springs break and lose their tension, they are still dangerous to handle. The full weight of your door relies on them, and you probably won't be able to open it without these components. Broken spring replacement is one of the more dangerous tasks that you may come to require, so contact our experts at Garage Door Repair Gresham to let our professional technicians handle it for you.